It has been argued that the Battle of Messines was the most successful local operation of the war, certainly of the Western Front. Carried out by General Herbert Plumer's Second Army, it was launched on 7 June 1917 with the detonation of 19 underground mines underneath the German mines. The target of the offensive was the Messines Ridge, a natural stronghold southeast of Ypres, and a small German salient since late 1914. The attack was also a precursor to the much larger Third Battle of Ypres, known as Passchendaele, decided upon by the British Commander-in-Chief Sir Douglas Haig following the collapse of the French Nivelle Offensive earlier in May 1917. General Plumer had begun plans to take the Messines Ridge a year early in early-1916. Meticulous in manner, Plumer preferred to plan for limited successes rather than gamble all on a significant breakthrough. In preparing for the Messines battle he had authorised the laying of 22 mine shafts underneath German lines all along the ridge, his plan being to detonate all 22 at zero hour at 03:10 on 7 June 1917, to be followed by infantry attacks so as to secure the ridge from the presumably dazed German defenders, the infantry heavily supported by the use of artillery bombardments, tanks and the use of gas. Work on laying the mines began some 18 months before zero hour. One mine, at Petite Douve Farm, was discovered by German counter miners on 24 August 1916 and destroyed. A further two mines close to Ploegsteert Wood were not exploded as they were outside the planned attack area. In the face of active German counter-mining, 8,000 metres of tunnel were constructed under German lines. Occasionally the tunnellers would encounter German counterparts engaged in the same task: underground hand to hand fighting would ensure. Heavy preliminary artillery bombardment of the German lines was begun on 21 May, involving 2,300 guns and 300 heavy mortars, ceasing at 02:50 on the morning of 7 June. The German troops, sensing imminent attack, rushed to their defensive positions, machine guns ready, meanwhile sending up flares to detect British movement towards the ridge. Silence prevailed for the following twenty minutes until, at 03:10, the order was given across the line to detonate the mines, which totalled 600 tons of explosive. Of the 21 mines laid 19 were exploded. The invariable loss of surprise in the use of a preliminary bombardment was entirely offset by the effect of the mines, which blew the crest off the Messines-Wytschaete ridge. Audible in Dublin and by Lloyd George in his Downing Street study, the combined sound of the simultaneous mine explosions comprised the loudest man-made explosion until that point. The lighting up of the sky as the detonations ran across the ridge was likened to a 'pillar of fire'. The effect of the mine explosions upon the German defenders was devastating. Some 10,000 men were killed during the explosion alone. In its wake nine divisions of infantry advanced under protection of a creeping artillery barrage, tanks and gas attacks from the new Livens projectors which were designed to throw gas canisters directly into the enemy trenches. All initial objectives were taken within three hours. Reserves from General Gough's Fifth Army and the French First Army under Anthoine reached their own final objectives by mid-afternoon. German troops counter-attacked on 8 June, without success, in fact losing further ground as the attacks were repelled. German counter-attacks continued in diminishing form until 14 June: by this stage the entire Messines salient was in Allied hands. 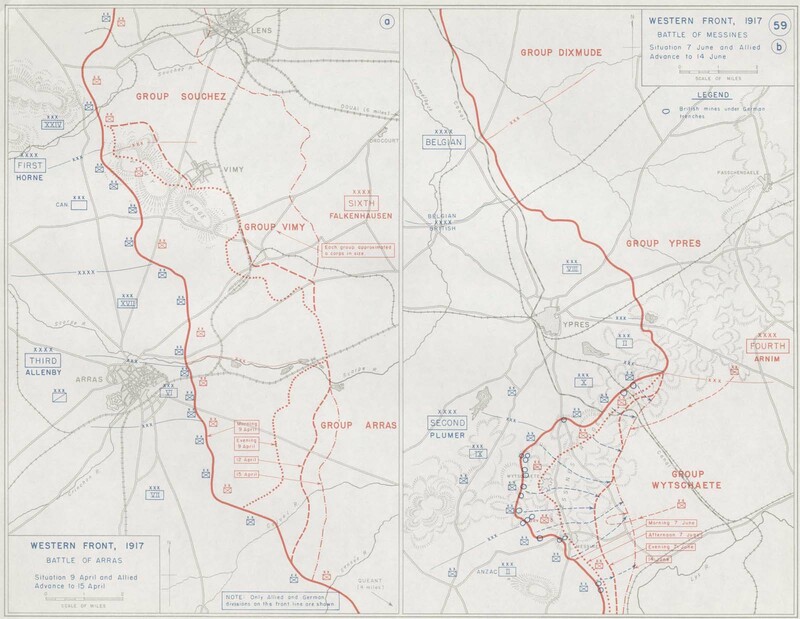 The Messines battle, which greatly boosted morale among the Allies, signified the first time on the Western Front that defensive casualties actually exceeded attacking losses: 25,000 against 17,000. Of the two mines which remained undetonated on 7 June, the details of their precise location were mislaid by the British following the war, to the discomfort of local townspeople. One of the mines was detonated in a thunderstorm on 17 June 1955: the only casualty was a dead cow. The second mine remains undetected, although in recent years its location is believed to have been pinpointed. No-one has as yet attempted its recovery. Click here to view a map charting the progress of the battle. The term "Grand Slam" was British slang for a pending battle or attack.